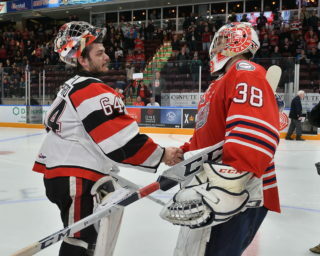 Arguably the star of the series, Kyle Keyser shone brightly once again on Monday, making 34 saves as the Oshawa Generals defeated the Niagara IceDogs 3-2 to advance to the Eastern Conference Final. Keyser was the difference in a series where his Generals were considerably outshot. 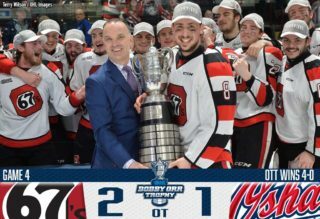 The Boston Bruins prospect holds an 8-3 record along with a 2.09 goals-against average and .943 save percentage over 11 playoff contests as the Generals are off to the East Final for the first time since their 2015 title run. The 20-year-old played to a 32-8-3-0 record this past season with a 2.75 goals-against average and .915 save percentage. He was a free agent signing by Boston in October 2017. 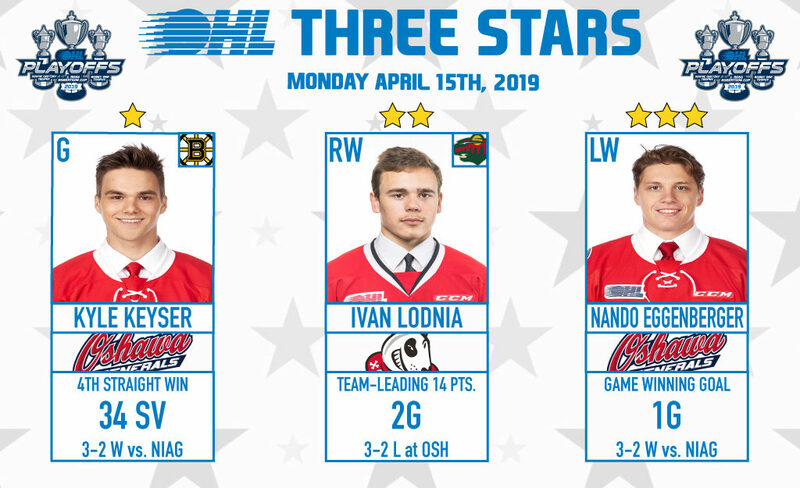 Minnesota Wild prospect Ivan Lodnia scored twice in Monday’s 3-2 road loss in Oshawa as the Niagara IceDogs saw their season come to an end. 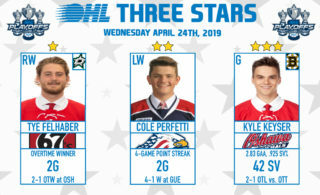 The 19-year-old native of Novi, Mich. led the IceDogs in playoff scoring with 14 points (4-10–14) over 11 contests, putting up a trio of three-point performances along the way. A former OHL champion with the Erie Otters in 2017, Lodnia recorded 45 points (17-28–45) over 41 games this past season. Over his four year OHL career, Lodnia registered 200 regular season points (79-121–200) over 231 games. He was Minnesota’s third round pick in 2017. 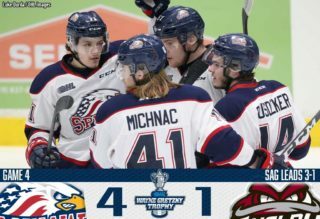 Nineteen-year-old Swiss winger Nando Eggenberger scored the game winning goal, pushing the Oshawa Generals into the Eastern Conference Final with a 3-2 Game 6 win over the Niagara IceDogs. Eggenberger entered the zone, taking a pass from Kyle MacLean to wrist a shot past Niagara’s Stephen Dhillon with 1:05 remaining in the second period. Eggenberger has eight points (5-3–8) over 11 playoff outings. He captained Switzerland at the IIHF World Junior Hockey Championship this past January.